Reiki Shares are for students who have completed Reiki Level 1 either with Melina or with other teachers. We will normally begin with a short group meditation to ground and center ourselves, followed by open discussions relating to Reiki, practice, techniques, skills, issues, and related topics. 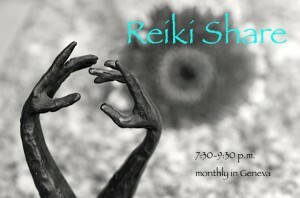 The rest of the time is dedicated to Reiki exchange. Please contact me, if you are interested in participating.